All 16 Gap Factory promo codes have been verified and tested today! You can get discounts on your apparel and accessory purchases without having to use a Gap Factory coupon. When you check out the Deals section, you can find all kinds of markdowns with discounts up to 70% off or more. You’ll find three discount section to shop from: Steal and Deals, Sale, and Clearance. You can also find Gap Factory promo codes for even more discounts on already marked down prices. If any item that you purchase is marked down within 14 days from when you purchased it, you’ll be eligible for a price adjustment. To get a price adjustment, just contact the Customer Service Department via phone or email to get your refund. Unfortunately, any items that were Final Sale or purchased with a Gap Factory coupon code will not be eligible for a price adjustment. Check your order status after you place your order to find out when your items will arrive at your front door. To get an update on your package, go to the “Orders and returns” page at the top of the homepage and enter your order number and email address. If your update says “in-process” that just means that your shipment is still being processed and hasn’t been shipped yet. Start getting rewarded for all of your purchases. When you apply for the Gap credit card, you’ll be able to earn points when you shop in-store, online, or anywhere that takes Visa cards. You’ll also get exclusive deals just for cardholders. Plus, when you sign up, you’ll get to save 20% on your total and receive free shipping on your first purchase with the credit card. You can apply for the credit card in-store and online. If your items don’t match your expectations, you can always choose to send them back to Gap Factory. Even if you used a Gap Factory coupon code on your order, you can still get a full refund on the items that you purchased. You’ll have up to 60 days to return your unworn items with all of the original tags and boxes included. You can also choose to return your items via mail or in-store. If you choose to return or exchange your items in-store, you just have to bring your items and your invoice to your nearest Gap Factory store. You can find your nearest store online. A sales associate will help you return or exchange your items. If you choose to return your items, your refund will be credited to your account in a few days. Save on classic and trendy styles when you use a Gap Factory coupon on your order. Shop some of the most popular for women, men, girls, boys, toddlers, and babies for much less than the listed price. When you’re ready to redeem your discount, enter your promo code in the box below your Order Total. 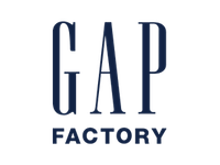 One of the best things about shopping for your clothes and accessories online is that you won’t need a Gap Factory promo code to save on shipping. If you spend $50 or more on your order, you’ll get free standard shipping on your entire purchase. If your order is $49 or less, you’ll only have to pay $7 for standard shipping. With standard shipping, you’ll get your items anywhere between 3 to 7 business days. You can also choose to get your items sooner if you select a different shipping method at check out, such as Expedited or Next Day. You can get your items as soon as 1 business day from when you place your order and you’ll only have to pay an additional $22. When you can’t find a Gap Factory coupon for your next purchase, you can just sign up for the newsletter. You’ll get a coupon for 15% off of your first purchase and free shipping on your entire order. You’ll also receive even more promotions and deals in the future once you join the newsletter mailing list. You can expect to see email notifications for limited-time sales, exclusive Gap Factory promo codes, new styles, and much more. Join the mailing list by entering your email address in the field at the bottom of the homepage. After you type in your email address, you’ll get your coupon sent to your inbox immediately.